Meanwhile, one of Dustin’s patients gets him deeply engaged in a string of drowning deaths involving drunk college boys. At first, Dustin dismisses talk of a serial killer as paranoid thinking, but as he gets wrapped up in their amateur investigation, Dustin starts to believe that there’s more to the deaths than coincidence. Soon he becomes obsessed, crossing all professional boundaries—and putting his own family in harm’s way. 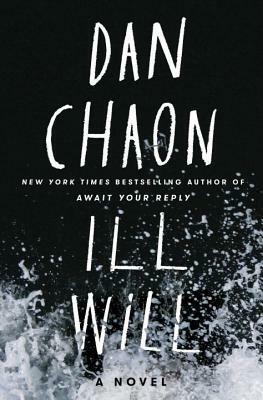 Ill Will is not an easy story to read. Hopping between the early ’80s and between 2012-2014, the story follows Dustin Tillman as he slowly gets involved in a serial killer investigation and learns that Rusty, his adopted brother is getting out of prison after his prison sentence was overturned because a DNA analysis proved that he didn’t do it. Rusty was convicted of killing Dustin’s parents and his aunt and uncle. The story also follows Dustin’s son, Aaron, a strung-out junkie trying to cope with the loss of his mother and trying to figure out who killed his best friend, Rabbit. If you have triggers, I don’t recommend you read this review. There will be talk about child molestation and drug use. Like I said in the above paragraph, this is not an easy book to read. It deals with a wide spectrum of issues…..from child sexual abuse to mental illness to drug abuse, it’s there and it is not glossed over and made pretty. Which was one thing I liked about this book, it wasn’t pretty. It dealt with all these issues in a real-world sense. No one was mysteriously cured of their mental illness or drug use. The Satanism cult angle was fascinating to read. I am old enough to remember the insanity over Satanic cults and the aftermath when it turned out that almost all of those memories were false. I really can’t comment anymore on that part of the book but I will say this. Read with a very open mind because not everything is what it seems. I didn’t know what to feel for Rusty. I felt awful for him because of the abuse he suffered at the hands of his mother and her “boyfriends”. No child should go through that and the author did keep true to the abused child abusing other children. But, however, Rusty was a really screwed up dude as an adult. When the author wrote from his perspective, I got the chills and did wonder to myself “How long until he kills someone”. Even the fact that he had a mental kill list was scary. Dustin was someone who truly scared me. He started off as a scatterbrained therapist and just morphed into someone else. I believe that his wife’s death along with Rusty being released from jail pushed him over the edge. To be honest, he had been on a slow slide into insanity since he was 11 and I think those two things pushed him over the edge. His obsession with the serial killer case that Aqil was working on him with even furthered the slide. It was sad to see it. Aqil. Let’s talk about him and how he totally fooled me. Yeah, not happy about that and I think I groaned when it was revealed who and what he was. I was like “Why didn’t I see that coming!! !” Totally frustrating for me but very good on the author’s part. Aaron was pretty dead on for a heroin junkie. Everything about him rang true. I did find it very sad that he slid into addiction after his mother died. I truly believe that it was a way to cope because his father was starting to flake out and his older brother was in college in a different state. But, even with his addiction, he still cared enough about what happened to his friend to go looking for the last person to see him alive. And oh boy, was he in for a surprise when he realized who it was. There are a couple of twists in the story and I didn’t see two of them coming. The one with Aqil (which I already mentioned) and the one with what really happened that night and how Rusty went on trial. I will say this, I was disgusted and very surprised. The ending was sad. NO HEA’s. Definitely no HEA’s. I do have a couple of questions about Aaron that I wish was answered. But with the way that the book was written, I don’t think that will happen….unless a book 2 happens. Why: This was a really hard book for me to rate. I liked the storylines, they were pretty easy to follow. But my main complaint is with how the book was written. It would go from normal chapters to almost a split screen format with what looked like Dustin or Aaron’s running thoughts in them. There were a few chapters like it and it made it very confusing to read because I couldn’t follow the trains of thought. Maybe it would be better to read it in paperback instead of on my Kindle. Why: Sexual themes, language, violence. Pretty descriptive scenes of child molestation, of murder sites and of murdered bodies. Also very detailed scenes of drug use.